You might think that a city the size of London is awash with great tea. Not so. What it is awash with is Starbucks-clones, over-priced tea and disinterested service. Hooray, then, for places like Café 171. 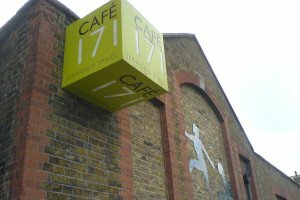 A stone's throw from the Tate Modern (admittedly you need a good throwing arm), Café 171 sits on the side of the Jerwood Art Space and Gallery. And if you think that's going to make it a very civilised, chilled place to have a cup of tea, well, fortunately for us all you'd be right. That's not to say there aren't some populist touches, because there are: if you want a chocolate muffin with your cuppa, you can, but equally if you're the kind of person who'd prefer a delicate croissant with your breakfast beverage, well, you're catered for too. As you might expect, varied tea tastes are provided for - as well as reliable English Breakfast, decaffeinated, Earl Grey and a range of fruit teas are on offer. Cakes, pastries and light snacks are on offer too, and there's a short, basic but nevertheless satisfying lunch menu too. In short, everything you want to be on the menu is on it. Not only that, it's all very reasonably priced too, especially when you remember how close you are to the very pulse of the throbbing metropolis. And my cuppa was good and strong, in a lovely big bowl of a cup - who could ask for more? Then there are your surroundings. You've got a choice of seating - indoors or in a small courtyard that, again considering your position, is surprisingly quiet and peaceful. And there is some sculpture on display too, in keeping with the artistic purposes of the Jervis Space itself. As if all that wasn't enough, there's plenty of reading material to accompany your cuppa too - decent newspapers, magazines aplenty, and more. It's worth rifling through some of the Jervis Space's promotional material too. All in all then, a great cuppa at a great price, a hop and a skip from the Tate and the Southbank - well worth seeking out if you're in that neck of the woods. Café Cenno's menu bears the proud slogan "a local business with a worldwide audience". Well, I don't know about that, but since it was opened by Tony Blair back in 1996 and has since won Durham's Tourism Partnership Quality Award, well, perhaps they're justified in making such lofty statements. 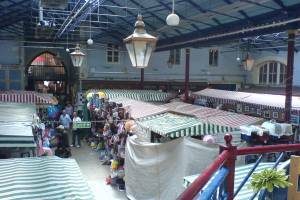 Speaking of lofty, a good part of the appeal of this place is its location - on the first floor of Durham's lovely indoor market, overlooking all the stalls below (as you might be able to make out from the photo). This gives Café Cenno an atmosphere that buzzes with the hustle and bustle of the market, yet somehow also manages to simultaneously lend it an air of detached tranquility - it's a haven from what's going on below. Whatever - regardless of the deathless prose with which I describe it, the café offers a great perch for people-watching. They're also rightly proud of their use of local ingredients - Café Cenno's menu told me exactly which butchers provide their meat products. Since I had a truly excellent sausage sandwich to go with my pot of English Breakfast tea, this was a good thing. Speaking of the tea - and we should, given the name of this website - all the right boxes were ticked. Firstly, there was a good selection, including decaff, fruit teas, green tea, and Earl Grey. Secondly, though my English Breakfast needed a little while to mash in the pot, it (eventually) had reasonable colour, taste and strength. And it was all served with a cheery smile, the importance of which cannot be overstated. Of course, being located within the market, this is one tea shop that doesn't open on Sundays, except in December when there are more shoppers to feed and water (it's opening hours are constricted by those of the market, see?). All in all then, this is a good showing for Café Cenno - great tea, great sausage sandwiches and great people-watching! The Community Café attached to the Orkney Fossil & Vintage Centre is, on the quiet, a very special little place. For a start it is, unlike the vast majority of establishments featured on Great Tea, staffed and run by local volunteers. As far as I can see, they do this for the love of the place and the love of their community. How brilliant is that?! I'm not going to go into the fossil and heritage centre itself - I didn't have time to go in and have a look around, so it would be unfair of me to review it here, though I will say it looks very interesting, and it has a nice little shop. No, let's concentrate on the Community Café itself - after all, that's what you're here for! The usual range of teas are offered and, of course, they're properly served (teapot, milk jug, cup and saucer - check, check, check). The tea itself is good enough, especially if you let the pot brew for a while, and the service is warm and very friendly. But what makes this place stand out, I here you ask? Well, it's the food you can have with your tea - specifically, it's the cakes. For starters, there's a truly excellent chocolate cake that I can recommend (which is also relatively low-cal, for a chocolate cake - this is something to do with it being made with mayonnaise, incredibly). Better still, though, is the marmalade cake - this is the sort of cake that makes you reminisce about being a kid and being spoiled by mothers/grannies/aunties and their amazing baking powers. First it makes you reminisce - then it makes you pause to consider whether you could squeeze another slice in. The Community Café, then, is a great endeavour that serves great cake and, best of all, you can wash it down with great tea. I look forward to a return visit. ...but since this is a tea-themed website, let's talk about that first, before we move on to the other aspects of Gerri's that warrant its inclusion here. There's a fair range of teas on offer, most of it Twinings. As with most of the tearooms featured here, fruit and herbal teas are offered, as are two brands of green tea and even Tetley decaff! And all the other boxes are properly ticked too: it's served in a pot, there's proper milk in a jug, service is fine. So far, so good. But nothing out of the ordinary, you might think. Well, you'd be wrong. Great Tea seeks to find good places to have a decent cuppa, unusual locations, features or selling points that you just don't get in a Starbucks or Costa Coffee. Gerri's has... ice cream. And plenty of it. Take a look at the picture on the left. 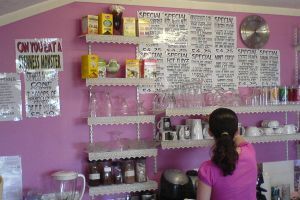 All those menu options dislpayed on the wall are different ice-cream sundaes and dessert options, flavours and concoctions. Since they're made with Orkney ice cream, they all taste great too. The real selling point though, the real draw, is the Stenness Monster! So it's worth taking a trip out to Gerri's for the Stenness Monster, and whilst you're there you might want to buy some sweets too, since they are sold from the jar as all good sweets should be. But remember, the Stenness Monster is a loss-leader for Gerri, so whilst you're there have a cup of tea or two and help keep Gerri in profit!